In this next group of videos, we're going to explore how to use forms. Forms have a front component where we build a form with HTML, but they also have a very active PHP component where we deal with the data and we deal with data validation. So this should be a lot of fun because forms really power interaction on a website. They enable users of a website to interact in a lot of different ways, users can authenticate themselves with log in forms, they can send contact information via contact form, they can add comments to a data, and a whole lot more. So this is where we begin exploring how forms work technically in a website. Now, when you're using Drupal, you're using forms at a different level. You're actually using a form builder rather than actually creating a form or knowing what's happening in the back-end with the form itself. 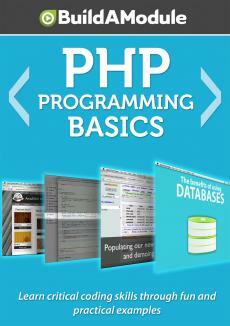 In order to really understand the PHP behind it, we have to build forms from scratch. Let's go ahead and take a look at the lifecycle of a typical form. To begin with, a form is generated on a website and displayed to the user. We create that form and it is HTML-based, but PHP may have a hand in how that form was built initially. Once the user sees the form, they can fill out the data and then they click the submit button and that data gets send to our website or the server that houses our website. From there, we decide what to do with that data, and this is usually where PHP really gets involved. We may decide to do some validation on that data to make sure that the user didn't skip some information and to make sure that the data conforms to what we're expecting. And if the data doesn't pass that, we might display some errors to let the user know, "Hey, you need to fill in your first name or your credit card number.